Seven in the morning. I stumble out of bed. Tubs and tubes litter the living room and dining table. I glance at the airlock. No popping or gurgling. No heady scents of bread and fruit. Dead yeasts have sat at the bottom of a fermenter caked in oxyclean for two days. I pop the lid, hesitant to see what bacterial outbreak has occurred. Yet, behold! Life! HA! HA! Take that trying to do something! Something did it all on its own! A worry persists however. Not starting the yeasts immediately allows other bacteria to join in. They can add off flavors. I have no idea what nasties might be breeding in there. To avoid wasting time with a bad batch, I will taste the must later. For now, let the yeast cells work their slightly gross-looking magic. 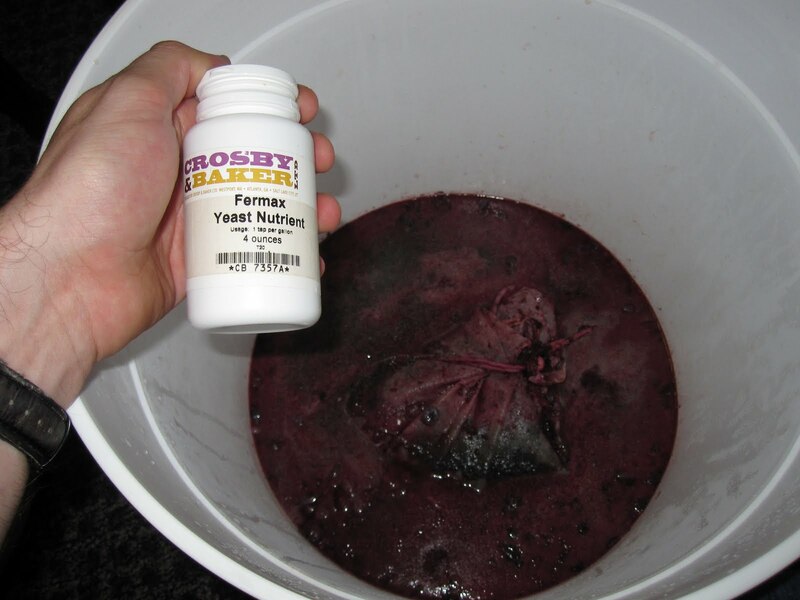 In addition to making alcohol out of sugar, the yeasts draw out color, tannins and further flavors from the skins. 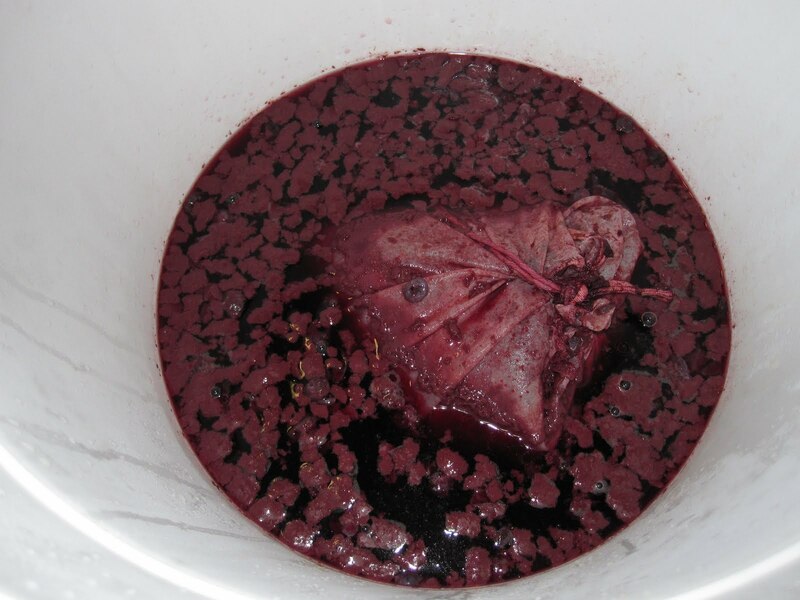 Although it looks like a liver-after-auspices, I leave in the sack of skins. This leaches out more, well, blueberryness. To encourage my late-bloomers, I hop over to my local zymurgist (of course I have one). Back home, my yeast fine dine on Fermax Yeast Nutrient. Although grapes and blueberries have similar nutrients, I doubt my recent oxyclean debacle has left much food for the yeast feast. Unlike Trimalcio’s never-ending dinner, my yeasts eat quickly. Not enough distracting entertainments, orgies or sugars probably. I stir the must to re-oxygenate them. Without oxygen, yeasts will go to sleep. More curious than brave, I taste the must. It is surprisingly fine. 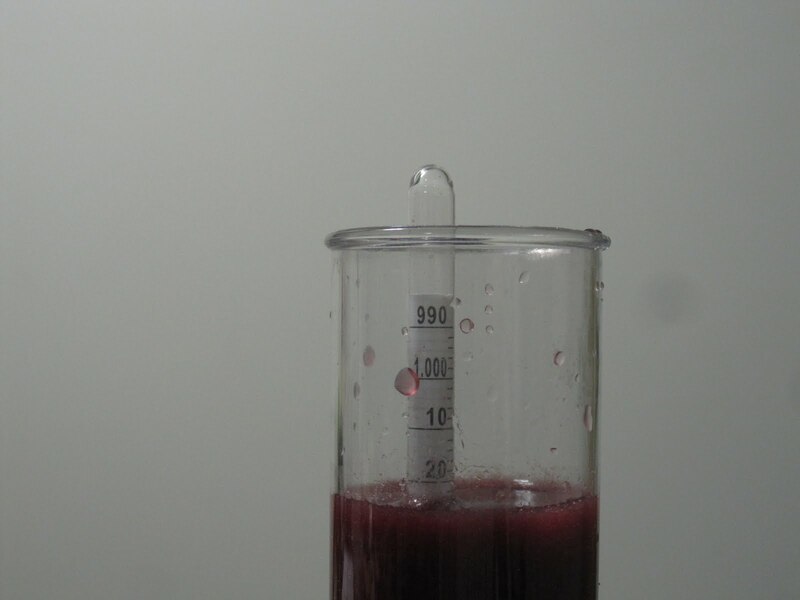 The yeasts and nutrient are there, but blueberry notes dominate. The body is medium, tannins low, acidity medium, CO2 fizz persists and sweetness still hangs around. 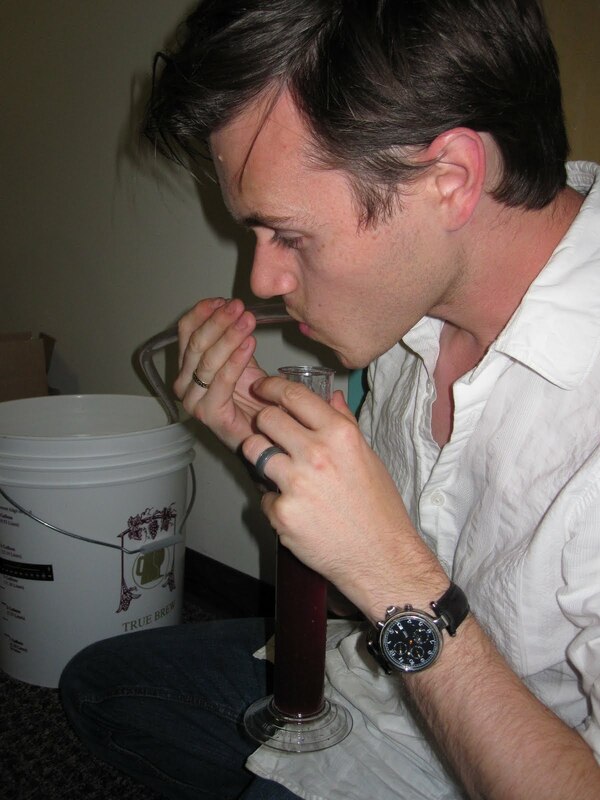 So I check the hydrometer in the (far more science-tastic than a wine bottle) test tube. We have crept to 1.020 S.G. Once it gets to 1.000 the yeasts will starve and sink to their grave. I check the forcast. A cold front is moving in for the night. This worries me. If the temperature drops near 59 degrees Fahrenheit, the yeast will slow down or die. We have no thermostat with central heating. So I treat my patient with a humidifier and blanket. Welcome back yeasties! 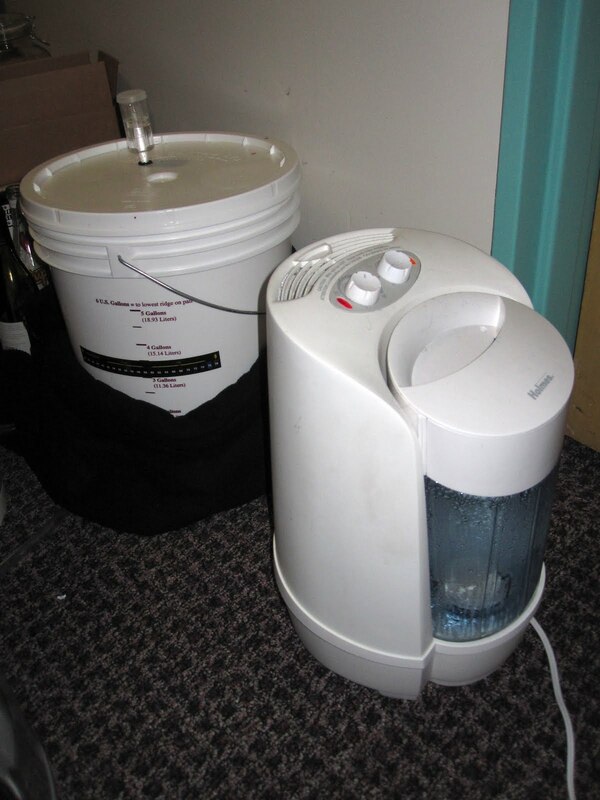 This entry was posted in BLUEBERRY BOUND: CRAFTING MY SECOND WINE (AUGUST 2010) and tagged airlock, auspices, blueberry, blueberry wine, fermentation, lazerus, satyricon, trimalchio, wine, winemaking, yeast. Bookmark the permalink.